David’s work is at the intersection of literature and human rights. 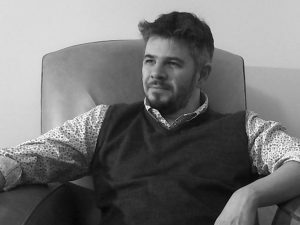 As an organizer of the Refugee Tales project on which he collaborates with Anna Pincus and colleagues at the Gatwick Detainees Welfare Group, David has helped articulate the call for an end to indefinite detention – the UK being the only country in Europe that detains people indefinitely under immigration rules. The way Refugee Tales makes that call is by sharing the stories of people who have experienced indefinite detention. Stories are told as part of large-scale public walks and have so far been published in two volumes by Comma Press. Using the books as arguments for change, Refugee Tales has engaged directly with policy makers towards a change of law and in that process the project has gained an international reputation as a model of innovative campaigning practice. Building on this work, David’s current monograph Making Space for the Human: Non-Persons, Persons, Movement in the Postwar World, explores the history of the juridical non-person with special reference to the period 1948 to 1958. Concentrating on The Universal Declaration of Human Rights, Hannah Arendt, Charles Olson and Frantz Fanon, the book provides an account of the intersection between literature and human rights, and re-presents models of thought from which the present crisis of non-personhood can learn. Published by Carcanet in the UK, David’s poetry has addressed the language of the ‘hostile environment’ and in so doing has sought to create spaces in which solidarities can form. He has been invited to read his work in Australia, Belgium, Canada, France, India, Italy, Poland, the USA and the UK and his collections include All Just (Carcanet 2012), Outwith (Bookthug 2012), Through (Carcanet, 2016), and Walk Song (Equipage, 2018). David is the author of John Ashbery and American Poetry (2000), Enthusiast! Essays on Modern American Literature (2007), editor of Contemporary Olson (2015), and series editor for Palgrave of ‘Modern and Contemporary Poetry and Poetics’ since 2017. His recent writings on the politics of human movement have appeared in Los Angeles Review of Books, Detention Unlocked, PN Review and the TLS. David Herd will co-supervise one MOVES research project: “Representations of Migrants: Discursive Features”.